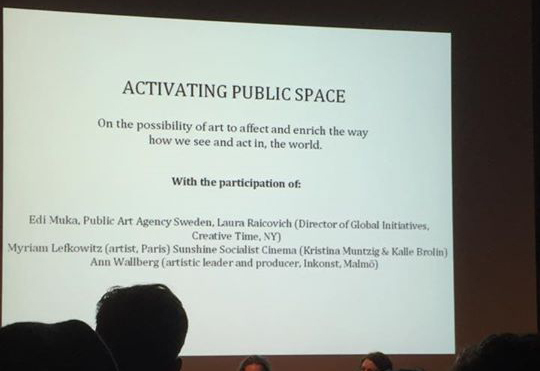 As New York-based Creative Time held its’ annual summit in Sweden this year, our cinema was invited to speak about art and public space in a panel arranged by Edi Muka at the Museum of Modern Art in Malmoe. Other panel participants were Laura Rakovich from Creative Time, artist Myriam Lefkowitz, and producer Ann Wallberg from Inkonst. Our part of the talk started out with a story about outdoor cinema in the Parque Rivadavia in Buenos Aires, and ended with the DIY outdoor cinema publications that we’re working on. Currently we have a simple folder (inspired by that page from the punk zine Sideburns, you know, with the three chords, “…now start a band!”), and we’re working on a more detailed description for a 16 page booklet to be released this summer. The booklet wil also be available as a PDF, but stay tuned for more info on that as the time of publication draws near. This entry was posted in Places to meet up and tagged Ann Wallberg, Creative Time, Laura Rakovich, Myriam Lefkowitz, outdoor cinema. Bookmark the permalink.